Diabetic maculopathy. Ophthalmoscope view of the retina of a diabetic patient showing retinal maculopathy. The retina is orange; red blood vessels and nerves emerge from the yellow optic disc (at left). 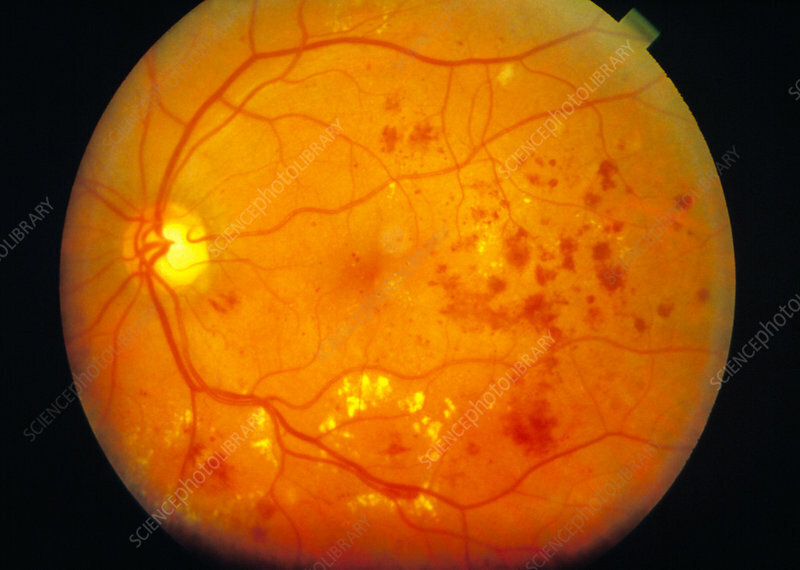 Yellow patches are seen around the retina caused by leaking blood vessels. Dark spots are dead cells due to inadequate blood supply (known as ischaemia). Diabetic retinal maculopathy is caused by damage to the blood supply of the retina that occurs as a complication of diabetes. These yellow patches are hard exudates which leak from blood vessels that have become permeable due to diabetes. The exudates can cause irreversible vision loss.